Hi, I’m Calli from Make it Do and I am so thrilled to be back here creating at Ucreate. I was walking down the aisle of my local hardware store the other day and spotted a roll of chicken wire. Somehow it made it into my cart despite not having any idea of what I could do with it. 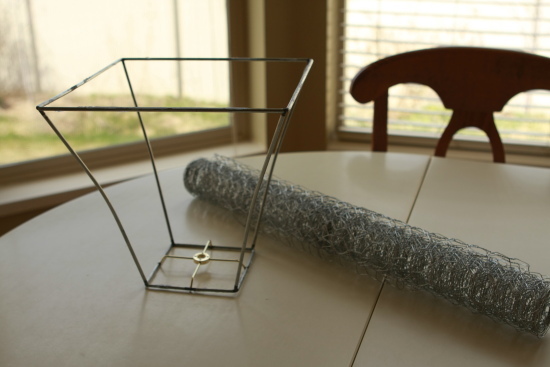 Maybe it was because chicken wire fits into the category of mason jars and clothespins for me. Practical and homey… with a timeless charm that I love. Just so my purchase wasn’t made in vain, I set to looking for the perfect project. My first thought was to make a bird’s nest lined with moss. 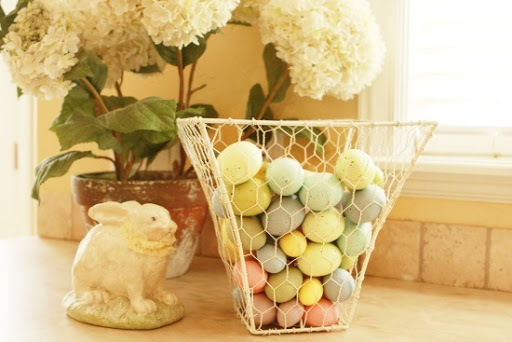 But then I spotted a chicken wire basket in a decorating magazine and thought I could make a something like that . First, I needed something to serve as a mold for my basket. After a scavenger hunt through my basement, I spotted an old lampshade. Taking a closer look, I realized it had a heavy wire frame under the fabric cover. Sorry for the pun, but Lightbulb! With its great flared shape, it would make a lovely basket. I just love giving old things new life. After a little deconstruction with scissors pulling off the fabric, my frame was ready for chicken wire. I left the top fitter wire in place on the frame, since it would have needed a small saw or some other nonsense to remove it. Plus I could always use it as a lampshade someday. Right? 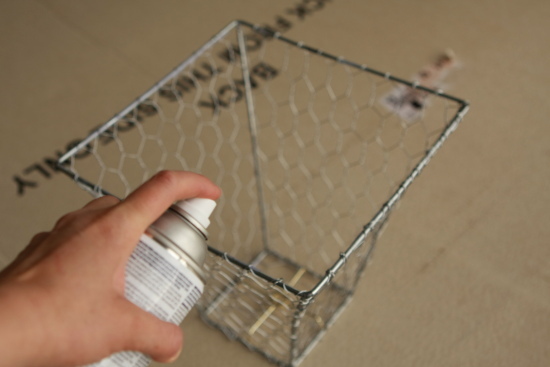 A word to the wise: you will want to wear leather gloves and eye protection for this project. 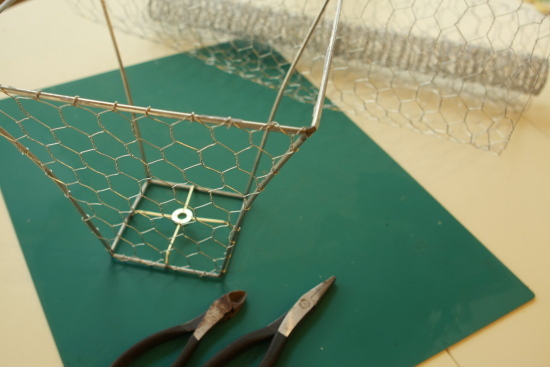 Chicken wire can be very sharp! 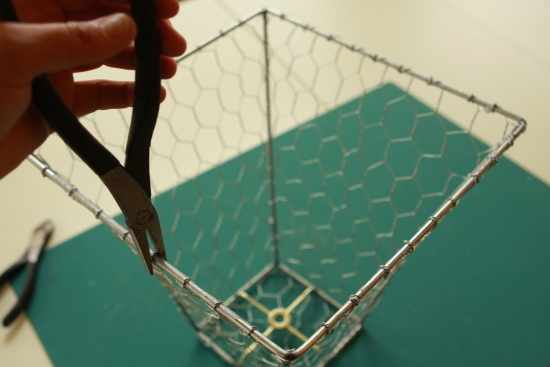 I laid the frame on it’s side, on top of the chicken wire, to use as a guide and clipped around it using wire cutters. Using needle nose pliers (my husband will say they are actually duckbill pliers) I twisted the wire ends around the frame on the first side. I repeated the process on the opposite side. Yes, I was reckless. I didn’t wear my gloves… and have a few scrapes to show for it. As I wrapped the wire, I made sure to pull the wires tautly. For the final two sides (which were opposite each other on the frame) I used one long piece so that the chicken wire covered the bottom and both sides. Again I laid the frame right on top of the wire to use as the guide to cut my wire. 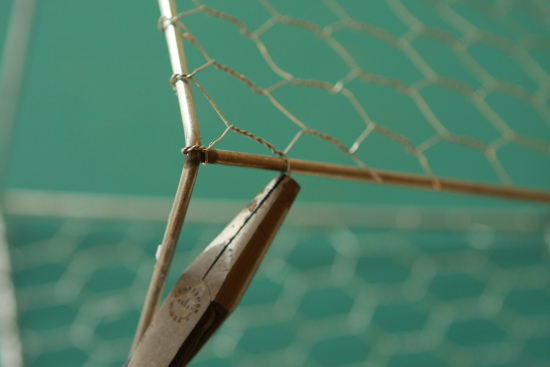 Remember when cutting your wire, you can always take some off, but you can’t put it back on. When in doubt, cut a little bigger. I ended up trimming off some of the wire as I wrapped the final side. 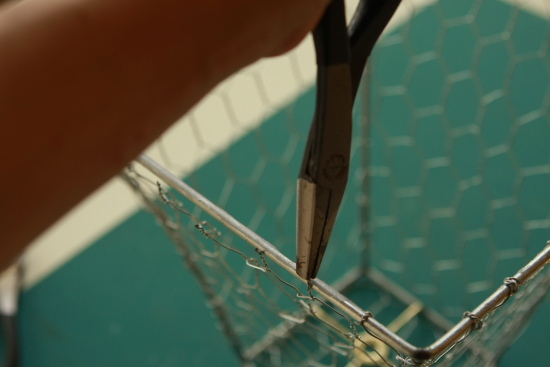 After I was done, I went around the entire basket with my pliers, carefully squeezing any loose or sharp ends. And the results… I just love projects that work like a charm. But it wasn’t quite done yet. So I picked out a can of spray paint. I almost went with a cornflower blue… but the versatility of antique white won out. Rusty brown or black would have been nice too. I was right, antique white is perfect for spring. The competition of how and where to use my new basket with will be likewise fierce. 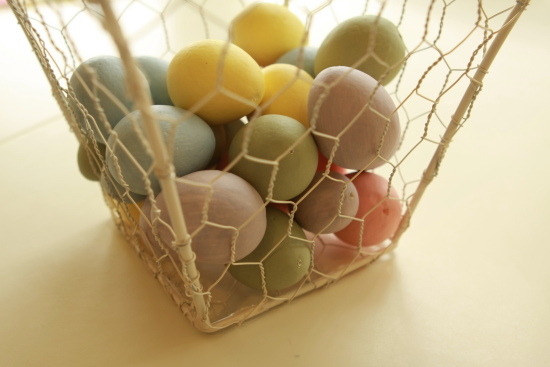 I love it filled with eggs for Easter. It also looks fabulous with the topiary. It is even cute as a small waste basket in my guest bathroom. All in all this was a fun and inexpensive project that only took me a few hours to complete. 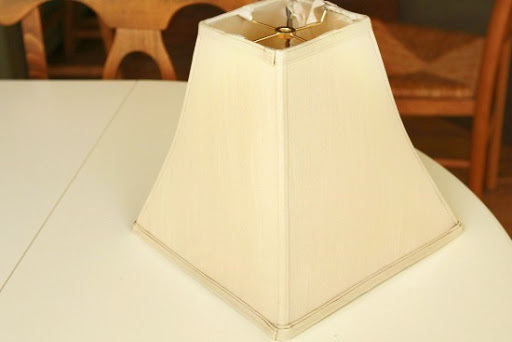 So next time you run across an old lampshade, don’t throw it away! 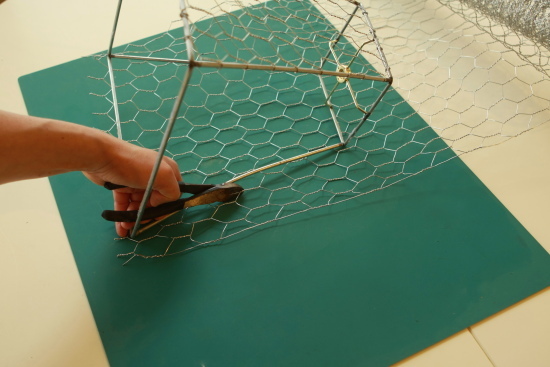 Introduce it to some chicken wire and make it into something really lovely. Come visit my at Make it Do anytime! What an awesome idea!!! I also love it with the easter eggs in it. But a wastebasket!! brilliant. Thanks Calli. I love this! Going to look for a lampshade (I have chicken wire). So glad I came across this. I have a lamp shade frame floating around my house. Wasn’t sure what to do with it. Now I do! guess what!? I have 3 empty lampshades that no longer match any of the rooms. Guess what I’ll be doing with them?! Thanks for the inspiration! I love your project! Wow, that is so… clever!!! When I get home I’m going to see what lamp shade that I change! wow, what an incredible transformation! That’s awesome! What a unique idea! That is a fabulous idea!! Great use for those lampshades gathering dust in my storage room. How cool is that? Using a lamp frame is GENIUS! Can’t wait to try this. aaack! that is SO CLEVER!! i want one and i have several old lamp shades perfect for the picking!!! thanks for such wonderful inspiration!! oh my gosh! i just really really love this!! 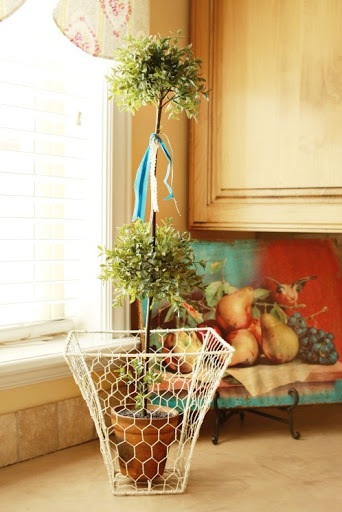 great idea to use a lamp shade..i made one a couple of weeks ago in the same manner but used a dollar store basket….great minds…..thanks for sharing! By the way- did I miss the Amy Butler pattern giveaway winners somehow? I’ve been checking but haven’t seen it- but I’m probably just blind haha! Spectacular!! That turned out completely awesome! Very clever idea. Love it. I envision a a cluster of these on my porch filled with potted plants in them. I have shades with no home. Now they will. Shut up! This is GREAT! That is stinkin’ adorable!!!! I am going to the thrift store a.s.a.p. to find lampshades! I am just so in love with this!! I’m featuring the tutorial on my blog tomorrow so I can remember to do it!! Thanks so much!! I really love the idea and result! I must try it when possible. Thanks for sharing! This is a wonderful idea. I love it! And, it can be used outside to hold a pot, or peatmoss – I just love this! Thank you so much for sharing! How amazing. (I knew I was hoarding chicken wire & that old lampshade for something.) Thank You, Calli! How fun and clever! It turned out just fab! Thanks for sharing this tutorial! I’ll be looking for lampshades on my next thrifting hunt! Faboo idea! I really like it! And I think it would make a cute lampshade!